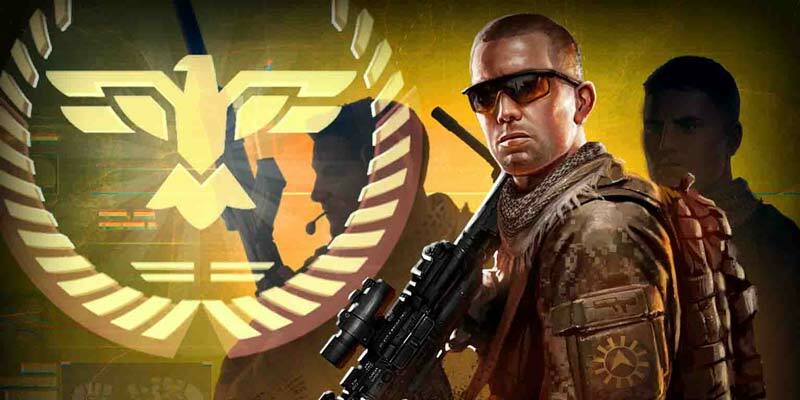 It’s true that you reap what you sow in all situations of life, and this principle can definitely be applied to Mobile Strike. 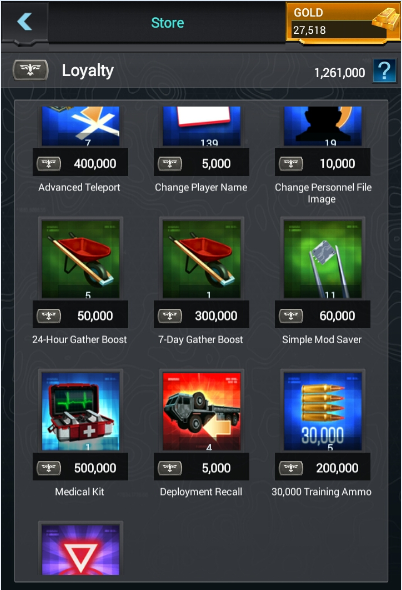 This article will show you all the different ways of gathering resources in Mobile Strike currently. This is more of a short-term solution, because it is not sustainable. The major perk of using resource packs is when you have a negative flow of food flow. Here is the rationale: With a negative income of food, any food on your base gets ‘eaten up’ by your troops instantly, as soon as you get any. By using packs, you can lose a minimal amount of food as you can open the amount of food you need, and so only lose a few seconds or minutes worth of food upkeep compared to far more if you opened and stored. The fact that they are split up into different size chunks of resource blocks is also beneficial. Personally, as of this moment I do not like trading so much as a method of obtaining resources, you can see my reasons below. If you are doing a “fair” trade, then you both would need to have a resource inequality or excess of the type you both want, i.e. I have extra coin which you want, and you have extra food which I want. 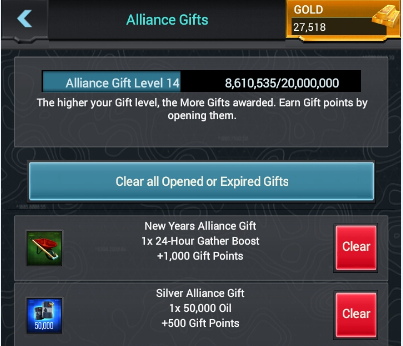 If you are ‘free-riding’ by asking for resources without offering anything in return, you are reliant upon the charity of your alliance- no resources are guaranteed and neither is the total amount. 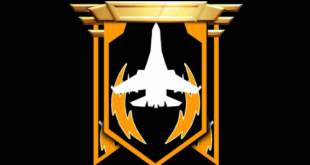 If you are a high ranked person in your alliance you may just be able to pull this off successfully though! As my screenshot illustrates, executing the trade includes a travel time, for your convoy to reach their base, and vice versa. If you are far away from the other player it is not a quick method of gathering resources, however if you are in a ‘hive’ then it becomes a more feasible method. The screenshot also illustrates that there is a tax being levied on my trade. 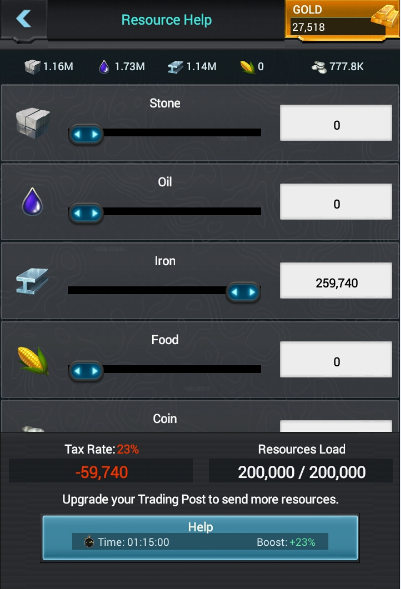 The tax rate does decrease as you increase the level of your Trading Post however I do not believe it ever goes to a rate of 0%, even at level 21. It may be of a low enough percentage for you to disregard it as a major factor, but for me efficiency is everything, and losing resources isn’t! Opportunity cost- construction time used for these buildings coupled with resources could be better utilized elsewhere, on other buildings/traps/troops/research. This argument is negated in some aspect with the recent introduction of the ‘engineering’ gear, which can bring build times down to instant from hours, combined with VIP free speedups and the fact that you may simply have spare resources! Gatherers don’t exactly bring you in tonnes of resources, unless they are at a very high level. To get there takes time. Even at high levels other methods of gathering resources, particularly farming will bring you in more resources for your time. The positive benefit of gatherers is that they work all day every day, no strikes for them! 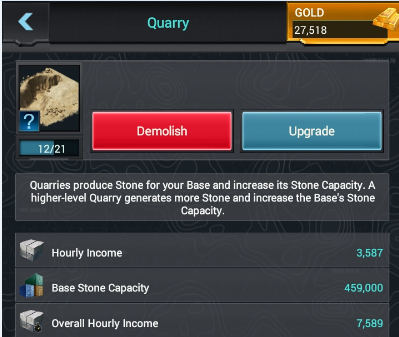 The hourly income you receive will keep rolling in until you hit your base resource capacity for that type of resource. When that happens, your gatherers produce nil, and are essentially useless. You can minimize the negatives of gathering and utilize your limited spaces for gatherers by a method called ‘specialization’. 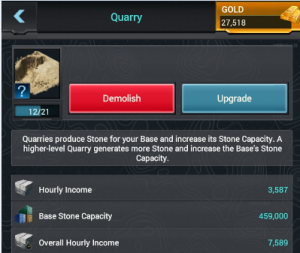 This means you only build one type of resource gatherers, leaving you with a massive base capacity for that type and a high income for it also. This can work well if you trade often with your alliance- you can give your resource for theirs, especially if everyone has specialized in different resources. 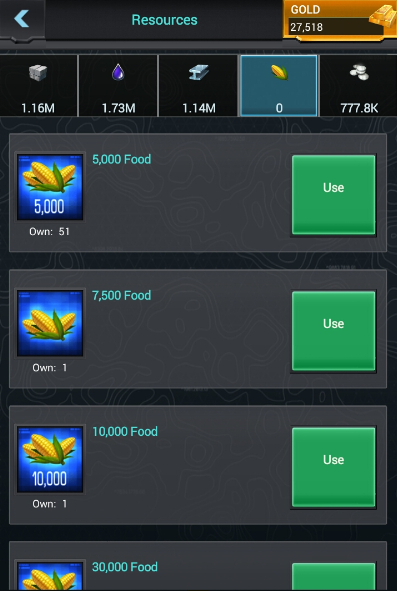 If you specialize in food, there is a double benefit, at least in the early stages of the game, when your troop upkeep is low. 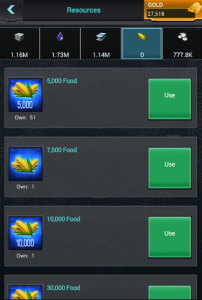 The first is having a huge amount of food coming in, and the second is this huge income stops you from having a negative income for food, even with troops. This only applies to a limit of course. What many people have done in order to obtain more resources without changing the layout of their own base is create ‘farm-accounts’. This secondary or latter account would solely be used as a ‘slave’ to the ‘master’ or primary account in the sense it would specialize everything possible into increasing resource production. This means commander points, research and speedups would be invested into upgrading resource producers. In order for this to be effective, resources would have to be transferred regularly, perhaps once a day, to the master account in order to have production halted on the slave. If in the same alliance, trading could be used, else PvP is an alternative, but longer method. These are a brilliant idea. It’s an incentive to play the game, like the blue supply crates you get from the bottom left of your screen. They provide you with free resources, materials and even loyalty, depending on which type of mission you choose. 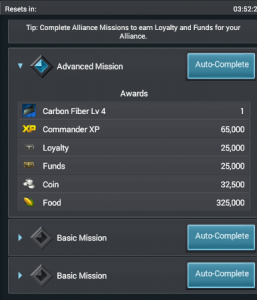 VIP missions provide the best rewards followed by alliance missions then daily missions. A useful tip is ‘delaying’ the collection of missions by starting the timer and completing it, but not collecting mission rewards. By doing this, your missions effectively become resource packs, which can be used whenever you like. 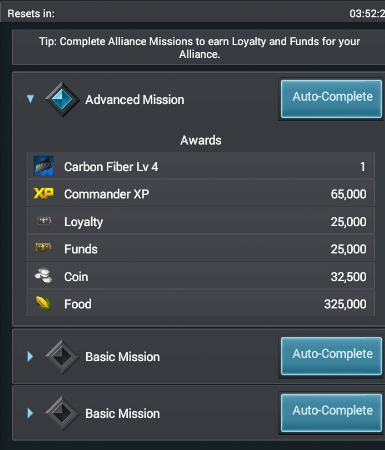 With VIP 7 you are able to auto-complete daily missions, VIP 8 Alliance missions. This purely is for convenience purposes as you can just collect them all at once, without any timers. 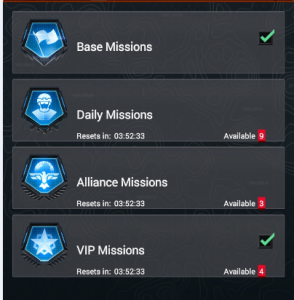 For VIP missions there is a “daily streak”, however I have noted to complete its 1000 points for a prize is not worth the effort, compared to the reward/prize received. Activating the 30 minutes/60 minutes VIP or any, after VIP running out gives you new missions, even if they all haven’t reset in total by the main timer. More missions= more rewards. To me, the effectiveness of attacking other players to obtain resources varies so much that I cannot write a blanket statement to say it is good or bad. What I can say is you can’t really rely on it as a primary source of resource gathering. Reason being that you lose troops when attacking, which costs resources to regain, and sometimes it’s simply not worth hitting a person, because you won’t get many resources off them. The time for your troops to go to attack a person, then return could be better used to gather resources on tiles. As your scouting improves, you can see all of the resources, units and traps a defender has. 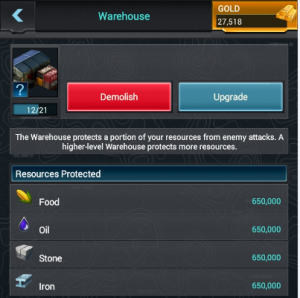 The warehouse protects each of the resources to a certain amount, apart from coin. So for me, if someone scouted me for 200k coin and 700k oil and 650k other resources, they would only be able to steal a maximum of 200k coin and 50k oil from me. To me that doesn’t seem worthwhile at all, but it all depends on how much you will lose, to how much you will gain. This is my primary method for obtaining resources, and the one I enjoy doing the most! It’s sustainable- you can do it anywhere on the map where resource tiles exist, at any time, individually. The worst that can happen when farming is someone ‘tile-hits’ you- they hit your troops when gathering resources. If your alliance is at war with another, this sometimes happens, so you must be vigilant to make sure you retreat your troops before they get hit, if a larger attack force is approaching. Farming offers a lot more resources than all of the other aforementioned methods of gaining resources, consistently, and the amount you can gain increases proportionally to the amount of troops you have – troop load is based on the number of troops * individual type of troop load. You can make your troops gather resources faster by a) using a gather boost which lasts for 24 hours or a week, and can be obtained for free via alliance gifts or b) putting skill points from your commander onto the gathering perks. Also, spreading out your troops along more resource tiles increases your overall resource gain, since on each tick of the game clock your troops bring in a set amount of resources, depending on the level of the tile, not on your troop load. 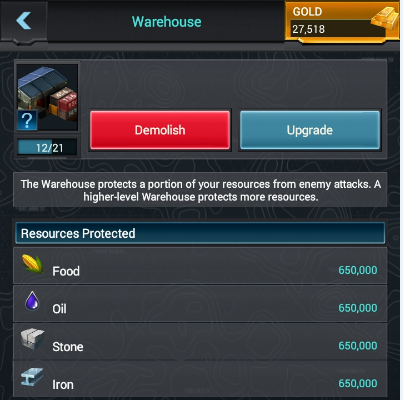 We all know that resources are a major part of the game, and not having enough can halt your progress to being a top player- the higher the level of upgrade you wish to do, the more resources you will need! It can be concluded therefore that as you progress through the game, some methods of gathering resources become better than others, since they provide you with more. For instance, resource packs are likely to diminish in usefulness in the ‘high-level’ game, since the maximum one pack provides is a mere 500k. In the entry game 500k of a resource can go a long way, but towards the end this amount does not even carry you to a single upgrade! Farming as a method of gathering resources is one that is only going to improve more and more as your commander improves in gathering skills, and you gain more troops. Me, I call it the gift that keeps giving! I’m HQ10 and have recently teleported from an area with lvl 1/2 RSS tiles that I reliably got 1-3 lvl1 materials (on top of whatever RSS the tile was) to an area that has lvl 4/5 tiles. 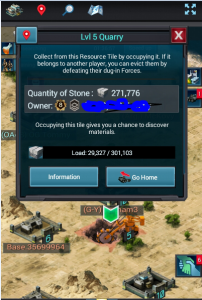 Despite my troop load being >200k I receive zero materials from lvl 4 or 5 tiles, only the RSS. Is there a cutoff point on deployment troop load where you start to loot materials + RSS from a higher level tile? Or is it dependent on HQ level? I can find no information pertaining to this issue anywhere in MS or GoW. Hi, How many times tiles have you farmed. To my knowledge this shouldn’t make any difference at all. I had farmed in excess of 40 lvl 5 tiles without getting any materials, but I think I’ve realised the issue. There is a Memorial Day event running this weekend and as far as I can tell no-one is getting mats from high-end tiles while this event runs, as instead we’re getting silver/gold stars, which are effectively equivalent to gifts. I’ll post again if the issue continues post-Memorial Day event, but I suspect it’ll be back to normal after the event. Note that the Maximum purchasable (Via redemption of gold) resource crate size is not 500k, For food it is 60,000,000, Oil is 15,000,000, Stone is 15,000,000, Iron is 15,000,000 and coin is 6,000,000. 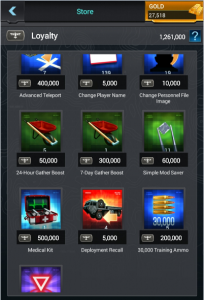 They can also offer other pack sizes when you spend money on it, I’ve seen 20,000,000 resource crates in purchased packs. Hi, it also called Gathering in GoW. For some reason it just started to become referred to as farming (probably a throwback to other games). what happens if you don’t farm a tile? will it just stay where it is or will it fade out and leave the spot blank? Hi, I don’t know about forever, but it will certainly stay there for a long time.